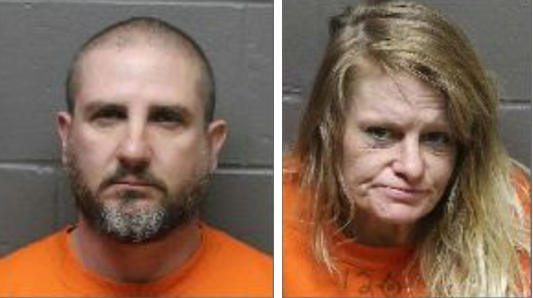 Two people were arrested Wednesday after a suspect in an Atlantic City robbery was stopped in his car driving around a woman with active warrants, police said. Officers Brian McDevitt and Michael Peters responded to a the robbery call at the 7-Eleven on Pacific Avenue at about 2:45 a.m., Sgt. Kevin Fair said. They were told that Bruce Savateri Jr. bought an item but, when the cash register opened, he leaned over the counter and grabbed a handful of money. The clerk tired to stop him, but Savateri ran from the store and fled in a car, according to the report. About 30 minutes later, the officers saw the vehicle at South Carolina and Pacific avenues. Savateri, 42, of Egg Harbor Township, was arrested without incident, and charged with robbery, theft and possession of drug paraphernalia. His passenger, 48-year-old Kathryn Putney of Atlantic City, was arrested on warrants. Both were taken to the Atlantic County Justice Facility.